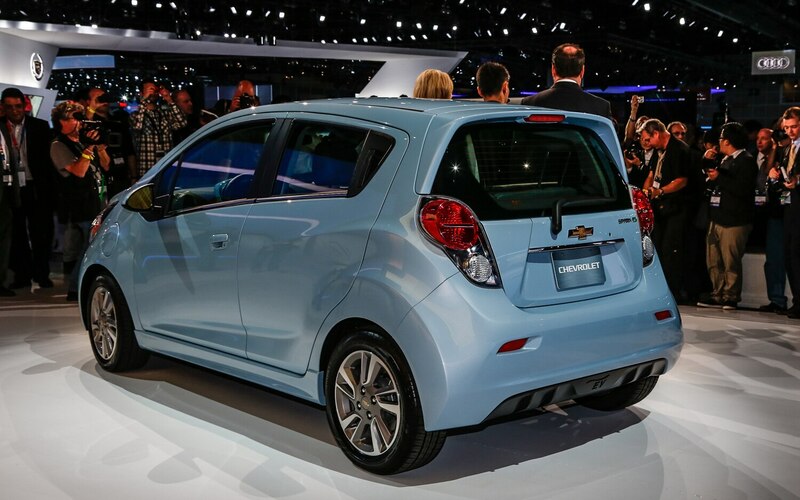 Chevrolet’s top designer John Cafaro likes to say the Spark minicar has larger headlamps than wheels. 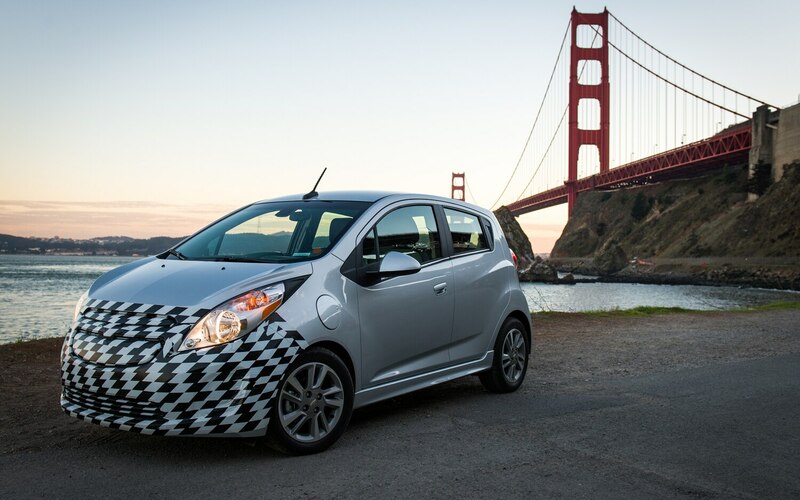 When it comes to the cute but startling Spark EV, visual drama is supplemented by an engineering feat for the sake of efficiency. 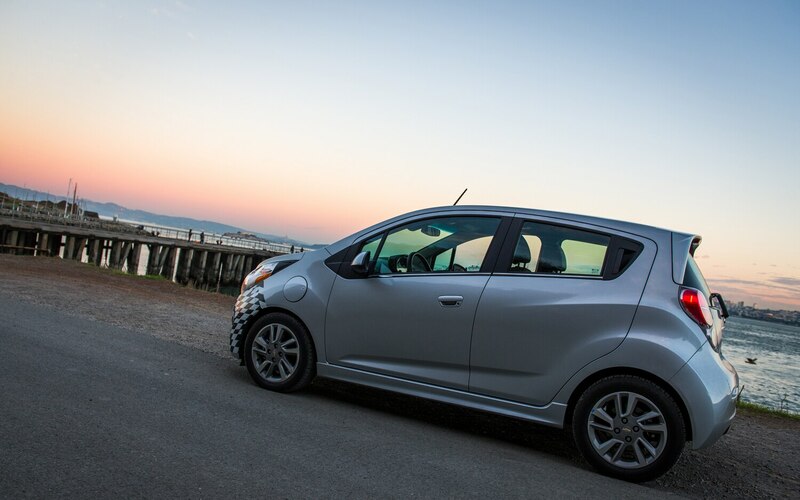 Global sales are the stated objective after the Spark EV goes on sale late next summer. 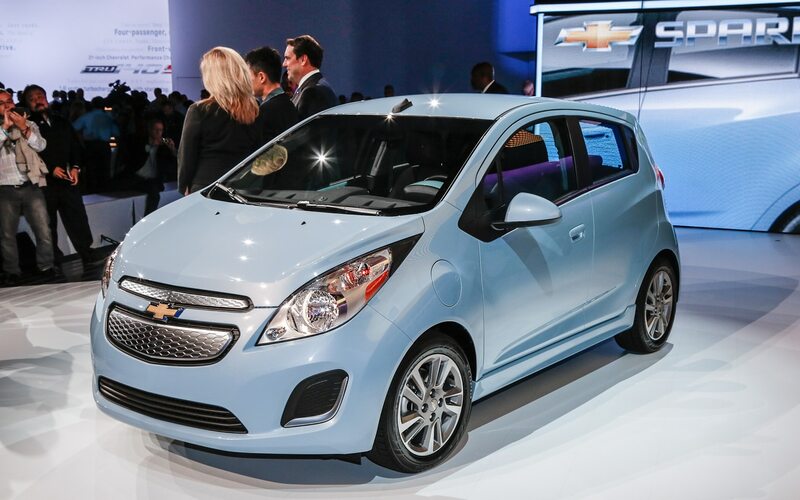 It will debut in select United States markets and South Korea, where the car is made. Unlike some other electrics, it can be purchased outright instead of acquired on a lease-only deal. Final pricing is yet to be announced, but buyers will get an 8-year/100,000-mile warranty on the 560-pound, 20-kWh lithium-ion battery. The five-door Spark relies on an outrageously bold stance and some crazy body colors, yet it still can’t help looking like a roller skate. The Spark EV bears only slight differences. 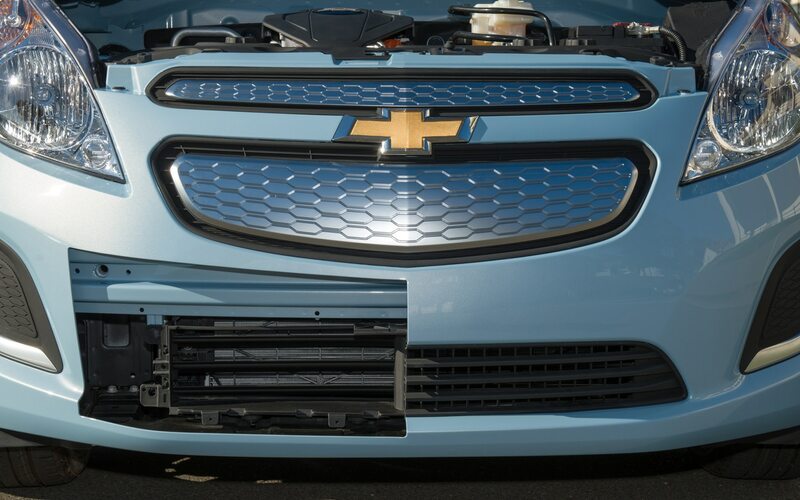 Chief among them, the paneled nose is stenciled with energy waves, a knockoff from the Volt. We briefly drove the preproduction prototype with lead development engineer Trista Schieffer alongside at Cavallo Point, an old fort near the northern end of the Golden Gate Bridge. Besides the nose job, the car was also trimmed with a prominent rear spoiler. While the final coefficient of drag hadn’t been determined, Schieffer assured us it would be lower than the current Spark’s. Three liquid-cooling and -heating circuits, each with its own dedicated water pump, course through the car. One of them addresses thermal management of the rear-mounted battery pack. “We can handle multiple charges in a day, even in a hot climate, because we have a liquid-cooled battery,” Schieffer said. The other liquid circuits are for the power electronics and the interior climate system. Additional external visual highlights include a tiny EV badge on the rear liftgate and unique 15-inch alloy wheels. At 6.5 inches, the rear wheels are wider to retain stable handling characteristics in the face of greater mass. Low-resistance tires measure 185/55 R15 in front and 195/55 R15 in rear. The left-front fender’s charging port betrays the means of propulsion. A hard-to-see functional difference is the actively shuttered lower-front air intake. Opening and closing as needed, this electromechanically controlled device responds to calculations of temperature, road speed, activity of onboard electronic systems, and the power draw demanded by the car’s occupants. 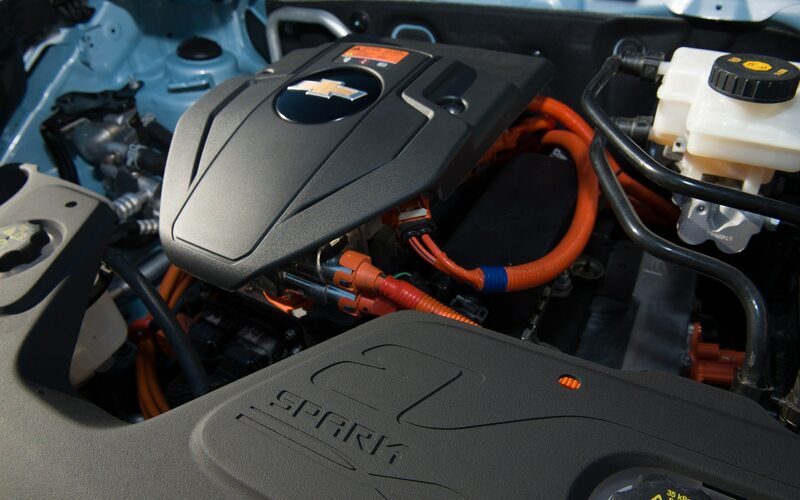 Lessons learned during the Volt’s development are of benefit to the Spark EV. 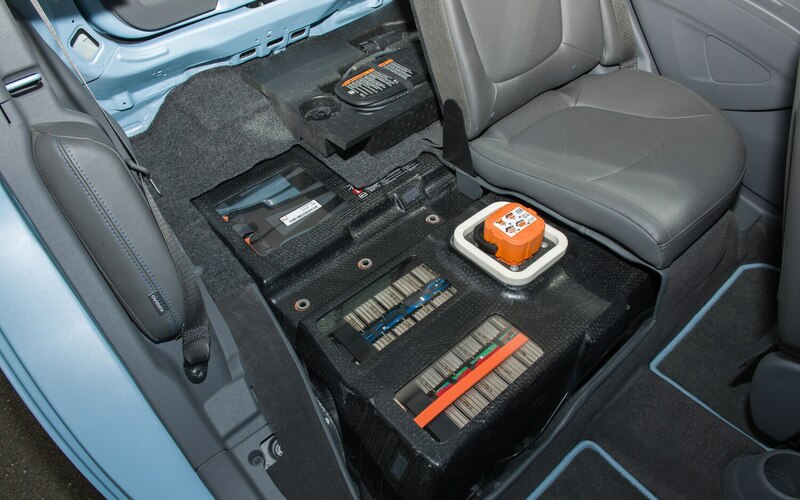 The squarish battery — made in Livonia, Michigan, and sent to South Korea for the final assembly process — comprises 336 cells grouped in four modules, and it fits neatly ahead of the rear wheels. 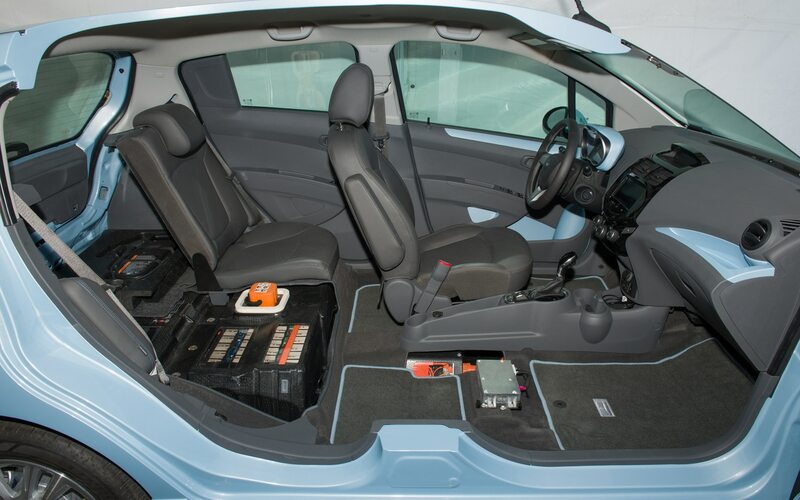 While rear cargo space isn’t compromised, the Spark EV does without a spare tire, substituting an inflation kit and charging cord in its place. The Volt’s familiar charging system is supplemented by DC fast-charging. Using the combination charger, one can bulk-charge the Spark EV to the 80 percent level in 20 minutes. Durability-test engineers had been fast-charging three times per day, seven days a week, with no ill effect, Schieffer said. 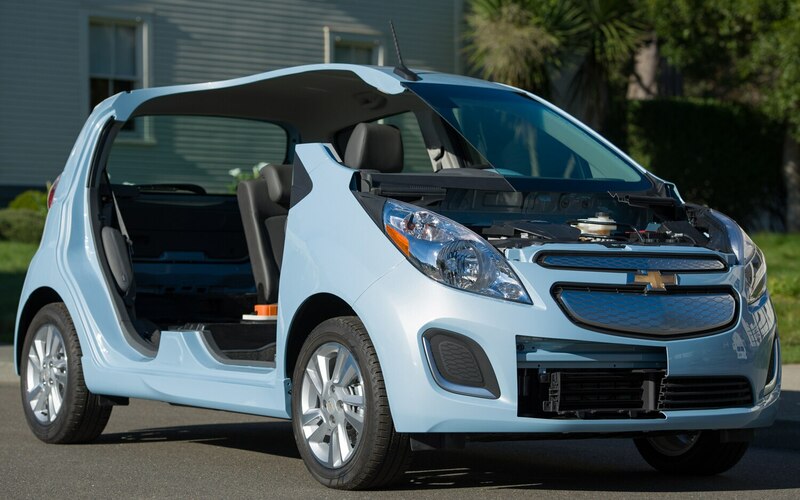 Sitting in place of the regular Spark’s 1.2-liter four-cylinder engine, the permanent-magnet electric motor produces the equivalent of 130 horsepower and lots entertaining torque (400 lb-ft, Chevrolet said, which more than doubles the output of the Ford Focus Electric and causes our eyebrows to raise). A single-speed planetary transmission handles the output. Driving with the strong push we’ve learned to expect of electrics, the Spark EV showed why it can achieve 0 to 60 mph in about eight seconds. It launched with a whir that one might hear from insects deep in a rainforest, and cruised with just faint powertrain noise and some rumbling from the tires. Steering was light and pleasant, torque steer wasn’t a factor, and the inescapable regenerative brake-grab stayed within reasonable expectations. So the biggest detriment was the awful dashboard reflection that appeared in the windshield. Meanwhile, the Spark EV is prudently equipped with the Pedestrian Friendly Alert Function. This vox parking lot emits variable levels of broadband noise and harmonics up to automatic shutoff at 18 mph, at which speed people and pets hear the Spark EV coming. Part of the story is the “confidence screen,” a special instrument-panel display that addresses range anxiety. 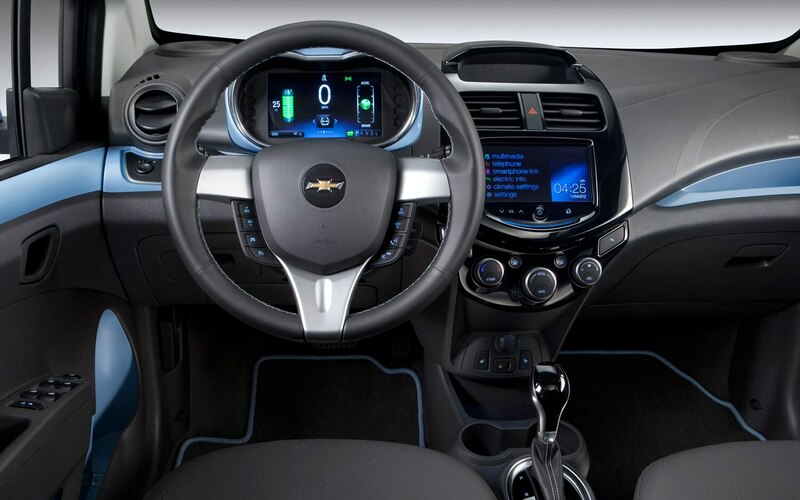 And some trick smartphone apps have been created, working in concert with the Spark EV’s standard OnStar connectivity, to monitor and regulate charging. 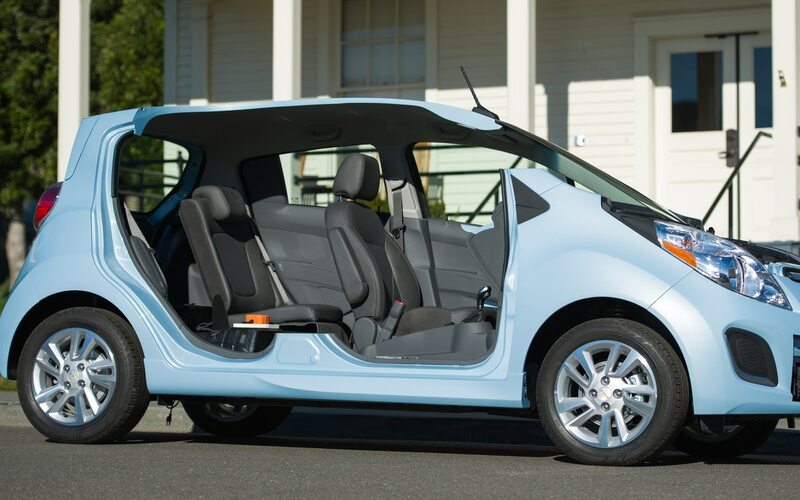 Ultimately, the fast-charging feature distinguishes the Spark EV from the Honda Fit EV and other electrics. In comparison to a petroleum-fueled car, this Chevy will be mostly likely prove to be costly, heavy, and one-dimensional. But by thinking outside the regulatory box, GM presents nothing here to show it isn’t serious about EVs.